I think I’ll come around to your place this week and sleep in your kitchen with the fan on full throttle. Looks like a good investment. I can’t believe you don’t have air conditioning in a wooden house. If you’re a “warmist” then you’ll know its only going to get warmer over the next years! Wow, this website is so much nicer when you use Adblock to block the entire theme. We put ceiling fans in the bedrooms and no longer use the air conditioning overnight. I wish we had put a couple in the lounge dining area and while I can’t imagine never using the air con, it would be less often. Were the fans in the bedrooms economically wise? Probably not if you already have air conditioning. Environmentally wise? Again probably not if you already have air con. I’m sure the manufacture and installation of them far outweighs leaving the air con on overnight. To Roger, believe me, the slowest speed is all that we need for sleeping. Maybe if you place is extra hot, medium speed. How have you been getting on with the downlights so close to the fan? We have a bulb on a batten holder near a fan and we can’t use them at the same time because of all the flickering shadows it causes on the walls. I need to get a pendant light so that the light source is below the level of the fan blades, but I’ve been dilly-dallying. An evaporative cooler would be good for you. They use little power (just a fan and a water pump) and work fairly well if it’s not too humid. As I write this mine (an Aussie made Convair Coolmaster that I found in the rubbish) is pulling in hot 43 degree air from outside and blowing 25 degree air inside at 76% humidity. A bit humid perhaps but not too hot. On high speed it only uses 200 watts and it is on low speed using even less power now. It is a portable model that I have backed up to a window and I put plastic panels around it so it only draws in dry outside air. I leave the windows in by bedroom and bathroom cracked open to let the air out. Since you have a house you might consider a rooftop ducted model which probably works even better and would cool the entire house. @Pip, I’m trying to come to terms with the fact that more air-conditioning when my power is from brown coal just makes emissions that little bit worse. Maybe I’ll reward myself with aircon after I’ve got solar panels. @Philip, one of the down lights is affected by the fan, and does cause some flickering. It’s not too bad if other nearby lights are on. 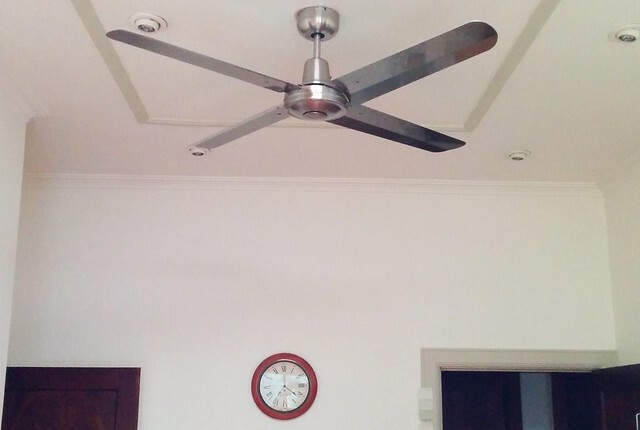 In Melbourne when it’s over 40, if you walk around the house in a damp shirt and use the ceiling fans (or other fans), you will definitely be cooled by the breeze they create. The airflow evaporates the water and that is what causes the cooling. This wouldn’t work in a humid climate, but works perfectly here. Daniel, looking forward to reading about your solar power experience. I would love to do it myself, especially with a north facing roof in virtual constant sun. However, the reduction in rebate (by the Labour govt astonishingly) put me off. Whilst last night was a bit uncomfortable because the temperatures never really dropped, I manage pretty alright in my double-brick ground-floor apartment by simply keeping it shut up tight during the hot days and opening it right up when the cool change comes through. Tonight I think I’ll open it all up at around 10, when by the looks of things the outside temperature will drop below the current indoor temp of 27. 27 is too hot for sleeping, but its fine for sitting around in your shorts. Certainly no need to keep the house 22 all bloody summer.